So, Bookworm needs braces. We’ve known this day would come, but we kind of buried our head in the sand and ignored it. However, now that he is almost 11, the time is here. Yikes! We saw an orthodontist at the beginning of February who recommended a two part treatment. This phase will likely last 15 months and will be when he is wearing braces to straighten his teeth. We had the choice to pay in full, to pay via monthly payments that are interest free, or to pay in phases. Even though I know the payments are interest free, I really, really never want to make payments on anything ever again. I want to pay cash and be done. We set a goal to pay cash for Phase One, which will cost $950 after insurance. Immediately after our consultation, I designated one of my jobs as “braces money.” All the money I make from that job no longer goes in our regular budget but goes straight to the braces fund. Doing this, I saved $487.84. Two of my other clients paid late. 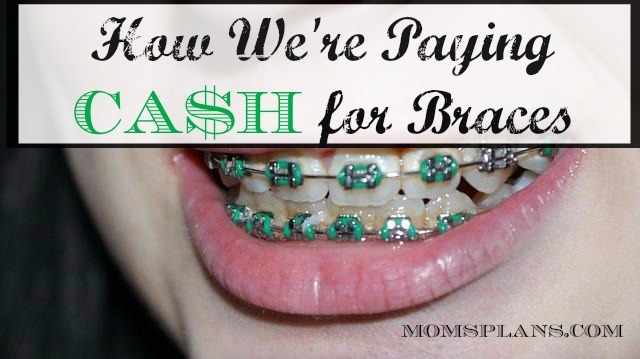 Since our budget was okay without that money, I funneled it all to the braces fund. That was an additional $250.30. My mom owed me $25, so when I got her check, it went into the braces fund. I sold a textbook and earned $20.09. Yes, right to the braces fund. That gave me a total of $783.23. I found out from my accountant that because I had decreased my workload so dramatically, I wouldn’t need to pay any quarterly taxes in 2015. I already had money saved for my January estimated tax portion, so I took $166.77 from that fund to save the remainder of what we would owe for Phase One. Bookworm will start Phase One in just a few days. I am so happy that we were able to save this money in less than two months and that we will be able to do Phase One without payments. The real challenge, though, will be saving up for Phase Two. Honestly, I’m not sure that we’ll be able to pay that one entirely in cash since it’s $2,330, but we’re going to try using the same strategies. We have a nine to twelve month window to save, and we’ll save as much as we can. Did your children have braces? If so, how did you pay for them? Great job saving the money. Can I ask why he has to have his upper jaw widened? Our orthodontist said that is very rare anymore and he never uses head gear. That’s a thing from the past. Truly curious. His upper jaw is much narrower than his lower jaw. He has not yet lost his baby upper canine teeth, but when he does, if his upper jaw isn’t widened first, the adult canines will overlap with the other teeth. There just won’t be room for them as his jaw is already so narrow. I’m curious to hear more about why your orthodontist says it’s rare now. How does he treat when one jaw is much narrower than the other? 🙂 If we could avoid headgear, that would be great. I believe he goes with something like Damon System braces. We did see another orthodontist who wanted to pull teeth, but that is less necessary now too. My son is in braces right now. He also got an expander at first to expand his upper jaw. We had consultations from 2 orthodontists, both of whom were recommended by friends. They both recommended the same treatment, and their pricing was the same. We paid around $6000 for everything (we live in a high cost of living area). We don’t have dental insurance, but even if we had, the options at my husband’s current and previous employer did not cover orthodontics. You are fortunate that yours does. We used savings to pay outright for the treatment and received a small discount. I am hoping my next 3 kids don’t need braces. They luckily have more space in their mouth. Probably will need them for my youngest though – but I have several years to save!